Msheireb station ... features 200-m-long and 180-m-wide structural dimensions. The Msheireb metro station is situated in the heart of Qatar’s capital and it is here that the three most important connections converge: the Gold, Red and Green lines. By 2020, 82 km of tunnel routes and 25 stations will have connected the residential and commercial centres with the suburbs and stadiums for the Fifa 2022 World Cup. In the final phase, the Doha metro system will feature a total of four lines and nearly 100 stations. He says the complex structural geometry as well as the massive reinforced concrete components, with up to 3-m-thick reinforced concrete slabs and wall thicknesses reaching 2 m, required a customised implementation concept and rapid material availability of the corresponding system equipment. “Thus, within a very short time period, Peri Qatar delivered 10,000 sq m of wall and column formwork as well as 150,000 cu m of shoring to the construction site,” the spokesman explains. 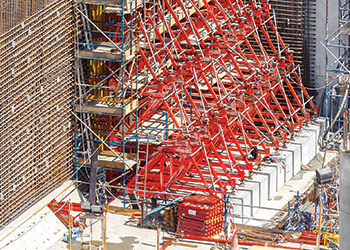 For forming the mostly large-sized massive walls, the proven and individually customised Vario girder wall formwork system is being used. In turn, for the single-sided forming of the 9.5-m-high wall sections against the retaining walls, SB brace frames supplement the Peri formwork solution and reliably transfer the fresh concrete pressure to the sub-structure. For the higher wall sections, Vario elements together with CB climbing platforms form crane-movable climbing units. The DK anchor system is used for the subsequent sealing of the tie points. These are reliably closed by means of concrete cones using a special sealing compound. “The project-specific shoring concept developed by Peri engineers for transferring the high loads is based on the proven PD 8 shoring towers, Multiprop aluminium slab props and Peri Up Flex modular scaffolding system. In particular, the Peri Up Flex allows optimum adaptation to suit the wide range of geometries and load requirements due to the 25 cm system grid,” the spokesman explains. 9.5-m-high walls were formed with the Vario girder wall formwork. A total of six stadiums for the Fifa 2022 World Cup in Qatar will be based in Doha, with up to a further six to be built in surrounding cities. All sports venues will be connected to the rapid transit system (light railway system) currently under construction and whose core is formed by the Doha Metro. The Msheireb station will now be built by Consolidated Contractors (CCC), after Qatar Rail terminated a contract last month with international consortium SOQ, which was responsible for building the main stations of Doha Metro. The SOQ consortium comprising South Korea’s Samsung C&T, Spanish contractor Obrascon Huarte Lain (OHL), and Qatar Building Company had won the $1.4-billion design-and-build contract for the Msheireb and Education City stations in June 2013. “Peri Qatar will continue to supply our formwork for the Msheireb project with CCC,” the spokesman confirms to Gulf Construction. The Msheireb station in Doha’s historical city centre is the biggest station within the Doha Metro development programme. 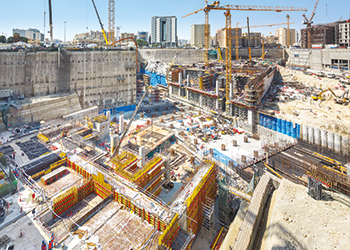 Under the so-called Doha Metro Major Stations Project package, Peri Qatar is also providing formwork and scaffolding solutions for the Education City major station. In addition, for numerous other stations along the Gold Line, Peri Qatar was also selected by the ALYSJ JV to provide efficient formwork and scaffolding solutions.